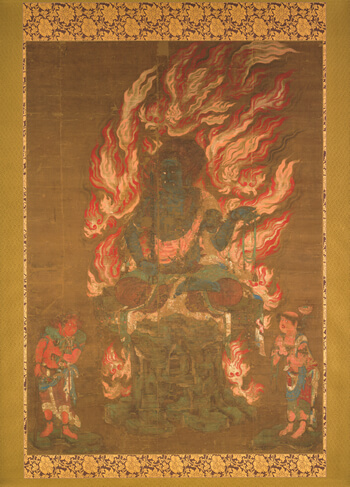 As introduced in textbooks, the “Ao Fudo Myo-o with Two Attendants” is called by the popular name “Ao Fudo” from the bluish black color of its body. Ao Fudo was made in the middle of the Heian Era, or around the 11th century, and was chosen as a national treasure for being a masterpiece in Japanese Buddhist painting history. The silk worship image has a length of 203cm and a width of 149cm, and the spirit of Fudo Myo-o that burns away obstructive thoughts and worldly desires overwhelms those who come to worship it. This national treasure was enshrined deep within Seiryuden, and people worship the exquisitely made replica out in front. On an appointed day of each month, people come to pray their desires and wishes with Goma (small pieces of wood to invoke divine help).At the last two exhibits, open for public, around 550 thousand people came to visit. Due to the god’s blackish-blue color, “Ao Fudo Myo-o with Two Attendants” is often called “Ao Fudo” for short. It is one of Japan’s Three Great Fudo Paintings. It is thought that it was painted sometime in the middle of the Heian Period, in the 11th century. As one of the greatest masterpieces in the history of Japanese painting, it was quickly designated as a National Treasure. It is a large silk painting for worship, with a length of 203cm and a width of 149cm. With the thick dark brown of its artwork-grade silk as the background, multiple red pigments depict a violently burning, earth-shaking blaze. In the center, a furious Ao Fudo Myo-o sits imposingly atop a boulder, holding a sword and a rope trap. The spirit of Fudo Myo-o, incinerating obstructive thoughts and worldly desires, overwhelms those who come to worship it. At Shorenin, this noble image, received from the Imperial court, has been deeply revered and worshipped as a treasure among treasures at the temple. The National Treasure itself is enshrined in the anterior chamber, but visitors may pray using a highly accurate reproduction at the front, and on certain days each month, Goma burning takes place to pray for people’s requests. Copyright © TENDAI SECT SHORENIN. All Rights Reserved.